Take your pick from two of Manhattan Toy Company's most popular and award winning baby toys, the Whoozit in classic blue or soft pink. Bright colors and high-contrast black and white graphics offer visual stimulation. 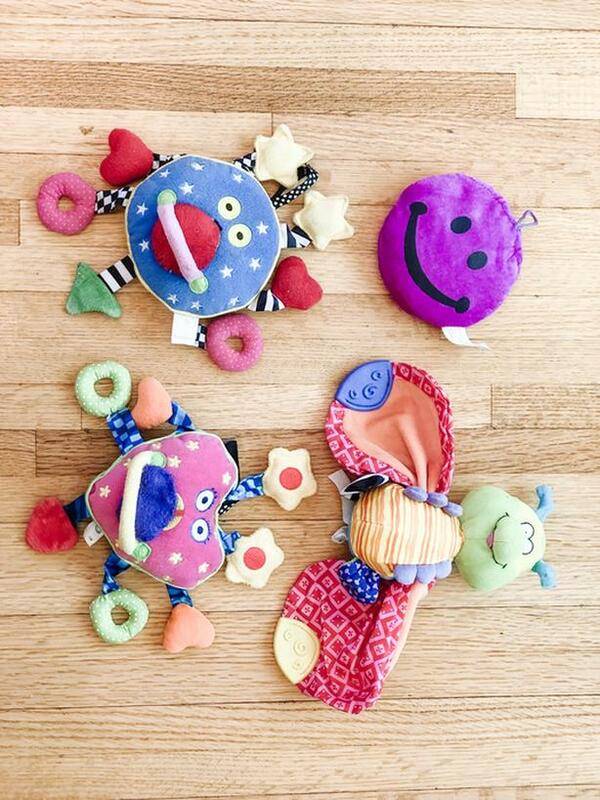 Plus, there's hidden noise makers including rattles, squeakers, and crinkle paper that perks up little ears. Baby Whoozit's variety of textured fabrics keep busy hands occupied. These stroller size versions are small enough to fit in a diaper bag or purse and perfect for the stroller or car. The butterfly is equally as playful for curious hands who love to explore different textures and colours. The Whoozit is probably one of my most highly recommended toys for babies!! All high quality toys in excellent condition. $7 EACH for the Whoozits and butterfly. $2 for the purple smiley face.